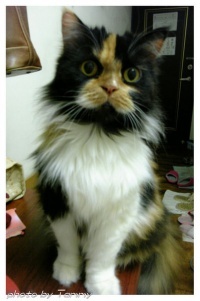 The Pet Wiki > Cats > Cat Care > Are Cats Happy Living Indoors? February 20, 2012 Comments Off on Are Cats Happy Living Indoors? There’s a long list of reasons for keeping a cat indoors. 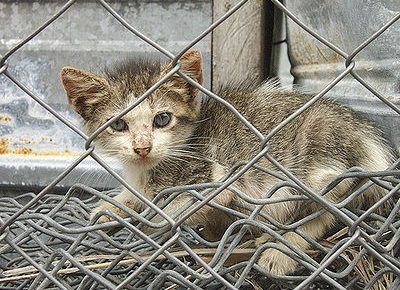 Cats allowed to go outdoors at will face many hazards – getting hit by a car, being stolen, injured fighting with other cats, dogs or other animals attacking them. And neighbors would not be pleased with a cat digging in their gardens or urinating and defecating on their property. While many diseases are airborne, the risk for infection is greater when the cat is outdoors. Cats are under greater stress being outdoors facing so many perils. However, different cats have different personalities and for some, the lure of the great outdoors is just too much. If your cat is one of those, there are solutions for the problem. You can take your cat out for regular walks. Purchase a harness because attaching a leash to a collar can cause injury to the cat. If you have a yard or a garden, you might consider investing in a cat-proof fence. This allows the cat to go out and explore, but the cat is unable to climb the fence and leave the premises. The fence also keeps strays out. There are enclosures that can attach to your house and will give the cat the feeling of being outdoors but will be well protected. But this doesn’t answer the question if your cat is content living indoors. Most cats are very happy to be inside, particularly those raised indoors from kittenhood. 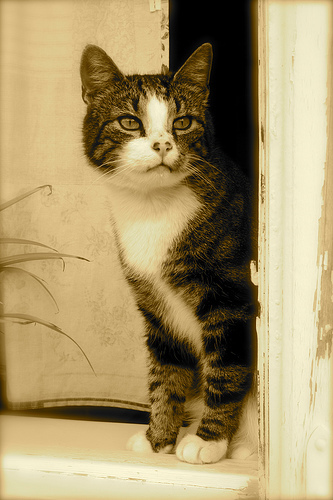 Most often cats enjoy the security of being inside while sitting at the window watching the rest of the world. You can provide enrichment for your cat to prevent boredom. First and most important is your companionship. Spend as much time as you can interacting with your cat – playing, grooming, petting. Provide a scratching post and different types of safe cat toys. Try teaching your cat basic commands like sit, down, stay and even some tricks. According to the Indoor Cat Initiative of the Ohio State College of Veterinary Medicine, they key to keeping an indoor cat happy is to provide acceptable outlets for its natural behaviors. For instance, cats sleep a good part of the day, because cats in the wild hunt for prey many times a day and rest in between. This means that your cat might sleep a lot while you are at work and prowl the house at night. If this disturbs you, adding more playing time to its schedule will curb the nocturnal prowling. Another behavior related to life in the wild is the instinct to hide. Cats will look for a tall or enclosed area to hide in when threatened. In the wild, cats are threatened by animals which consider it prey. In the house, cats may feel threatened by loud noises and unfamiliar animals. Provide your cat with safe places to hide, and make sure it is not hiding in any appliances before you turn them on. If you’re still concerned about keeping your cat indoors, think about getting a second (or more) cat as a companion for him/her.